Our outstanding Mogami 3104 Speaker Cables are now available in a Deluxe version. 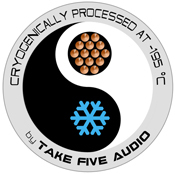 The 3104 Deluxe features all Deep Cryo Treated parts in it's construction as well as an attractive black tightweave sleeve and printed shrinktubes. These cables are a bi-wire configuration with spade or banana connections. Mogami 3104 speaker cables were designed to deliver maximum performance from state-of-the-art Systems. They offer true audiophile performance for accurate sound transmission with clear transparent response yet possess a rugged superflexibilty for the most demanding applications. Each conductor features many strands in rope-lay of famous MOGAMI 'Neglex' Oxygen-Free-Copper within colour-coded PVC insulation. A tough, low profile matte black superflexible PVC jacket protects the cables. (1) 6 ft Deep Cryo Treated Mogami 3104 speaker cable with black tightweave sleeve and terminated at both ends with Deep Cryo Treated connectors in a bi-wire configuration. The price will adjust automatically when you choose a different length. PLEASE NOTE: the base price is for 1 cable, if you need a stereo pair (or more) change the quantity to the number required. You can order as many cables as you need, in different lengths and terminations by hitting the "order" button after selecting each cable. The Vampire HDS3 5/16" spade is available as an optional termination. This spade is the same quality construction as the HDS1, the only difference is the larger size. If you are ordering spade terminations for your cables be sure to check the binding post sizes on your amps and speakers to ensure you are ordering the correct size for your application. In our bi-wire configuration we use the Vampire HDS5 if 1/4" spades are required at the speaker end.